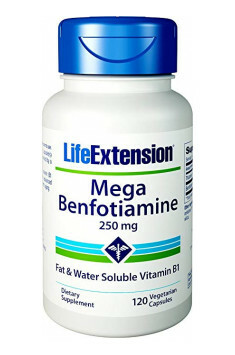 Life Extension Benfotiamine is a dietary supplement with two forms of vitamin B1, i.e. fat-soluble benfotiamine and water-soluble thiamine hydrochloride. Although the supplementation of the normal vitamin B1 form works brilliantly in everyday preventive healthcare, using even large doses is not always efficient in the case of treating clinical deficiencies. The main reason for that is the lipid barrier present in neurons. The solution for the above-mentioned problem is administering a modern, fat-soluble form of thiamine. Benfotiamine does not interact with other drugs, which guarantees the safety of use. Comparative studies confirm that after oral administration of benfotiamine, the concentration of thiamine in cells is five times higher. Moreover, it is cumulated in the brain, the skeletal muscles and the liver, as well as permeates to the cerebrospinal fluid where it exhibits its biological neuroactivity. Thiamine - a vitamin of the B complex; plays an essential role in metabolism, above all in metabolising carbohydrates and keto acids in the process of cellular respiration. Having entered the organism, it is converted into a biologically active form of thiamine diphosphate (TDP). Thiamine diphosphate (cocarboxylase) is a coenzyme of extremely important enzymatic complexes which catalyse the reactions of decarboxylation that determine the right metabolism of carbohydrates, branched-chain amino acids and in Krebs cycle. Moreover, it is a transketolase cofactor - one of the enzymes in the pentose cycle. The level of thiamine in people with diabetes can be even 75% lower than in healthy people. Thiamine affects the nervous system and brain functions as a necessary element of many metabolic and biochemical pathways. Determining normal glucose and carbohydrate metabolism, it enables delivering a sufficient amount of energy to nerve cells, which influences, e.g., normal concentration. Additionally, as a thiamine triphosphate, it participates in the transmission of nerve impulses and nerve growth factor (NGF) induction. Phosphorylating the chloride channel in a nerve membrane, it simultaneously performs the function of its activator. Thiamine deficiency is a reason for the occurrence of three syndromes: the beriberi disease, the Korsakoff's syndrome and lactic acidosis. Beriberi is characterised by peripheral nerve inflammation which can be accompanied by heart failure and oedemas. In people who have a high-carbohydrate diet, thiamine deficiency can be a reason for the increased concentration of lactate and pyruvate and, as a result, the occurrence of life-threatening lactic acidosis. As glucose constitutes the main source of energy for the brain, that metabolic defect manifests itself through neurological disorders. Benfotiamine - fat-soluble thiamine derivative. Its solubility guarantees great absorbability, a 5-time higher efficiency, prolonged effect and safety. It is used in medicine for the purpose of preventing metabolic diseases and diabetes. It effectively supplements vitamin B1 deficiencies, also in the central nervous system. It contributes to the reduction of diabetic complications: neuropathy, nephropathy and retinopathy. Moreover, it is applicable in alleviating severe pain and alcoholic neuropathy. Life Extension Benfotiamine is recommended for elderly, overweight and fatigued people, smokers, women who suffer from menstrual pains and those during menopause. Particularly advised for sportspeople and those who do hard physical work. Therapeutic application in preventing metabolic diseases and diabetes should be carried out under the guidance of a specialist. Mega Benfotiamine 250mg 120 caps. 1 capsule 1-4 times per day. Or consult a doctor. microcrystalline cellulose, vegetable cellulose (capsule), dicalcium phosphate, vegetable stearate, silica.